When I traveled to Florida this past summer to visit my son, we visited with some of his friends and enjoyed a swim in their backyard, saltwater pool. Off to the side was a glass table with a bunch of dried starfish, or sea stars, so I took a photo. The home owners were not home, so I didn’t have a chance to ask them where the starfish came from. I know they have a nice boat and suspect they may have collected them from a trip to a Florida beach, or offshore island. In Florida there are five armed sea stars, like the ones in the photo, and some with 9 legs / arms. Some have so many legs, like the feather star, that you wouldn’t think of them as starfish. I’ve never personally seen many starfish on Florida beaches. Occasionally there would be a piece on the sand, or more often I’d find living sea stars. Even those I didn’t come across too often. But I didn’t live on the beach and only took occasional day trips with the kids to spend a few hours. I’d love to have access to the beach in the early morning before the crowds arrive. Being able to walk along the shore at odd hours of the day, or right after a storm, would be wonderful. I’m envious of people who live near that expanse of nature that changes so rapidly and offers up such treasures. 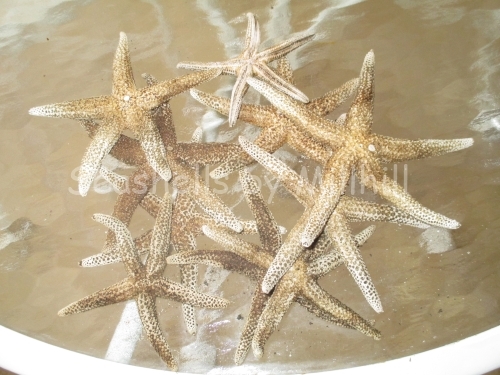 You can see native Lined Sea Stars in action at this post on the i Love Shelling blog. She also has an image of the 9-armed variety.